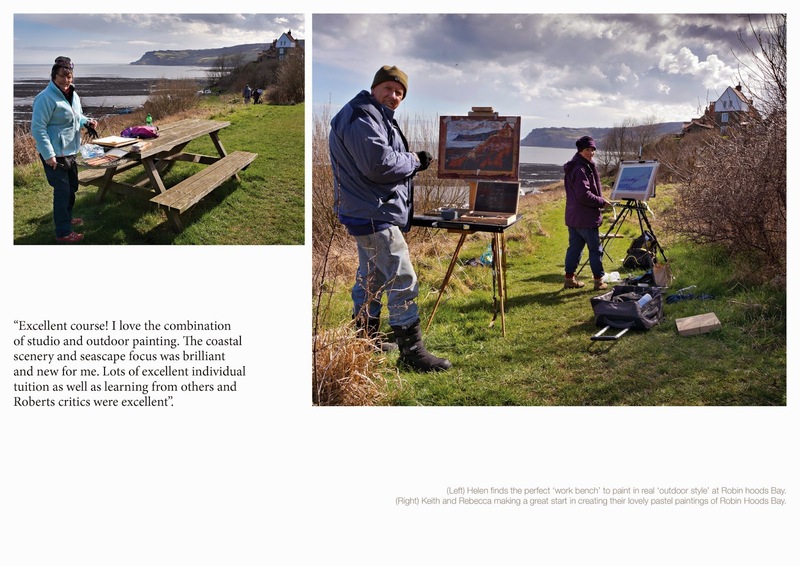 Happy times had by all and lots of creativity mixing indoor and outdoor workshops at Cober Hill near Cloughton (near Scarborough) on the East Coast of Yorkshire recently was another absolute success! 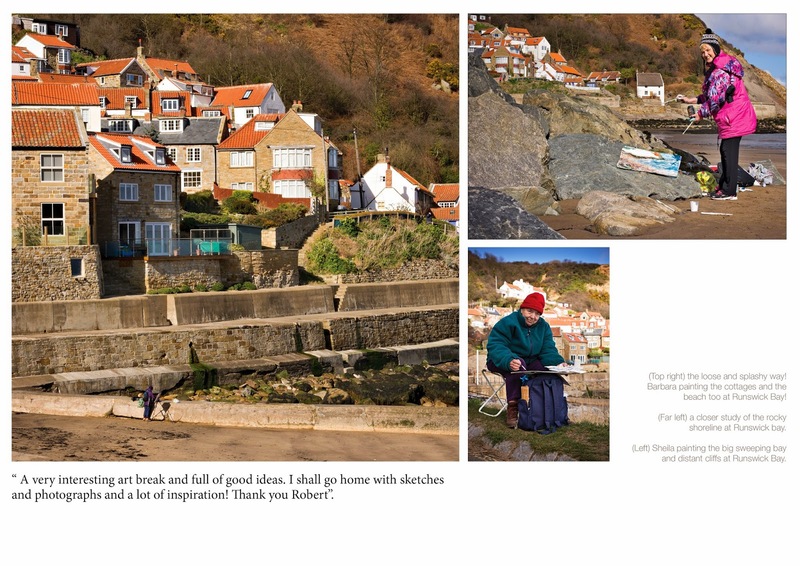 The sun shone for us all just when we wanted it to on our days out along the coast at Robin Hoods Bay and the ever popular Runswick Bay a little further up the coast. It was an absolute joy to teach a full class of art students of mixed levels of ability lots of different creative techniques to help their own styles develop on each and every day. 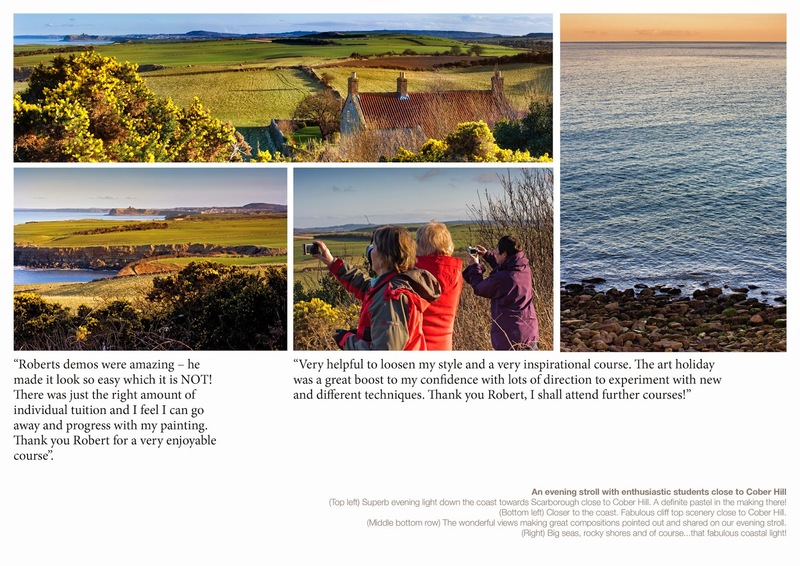 We had lots of fun in the evenings too with coastal walks exploring the stunning views along the coast near Cober Hill and shared stories at meal times and in the newly refurbished 'drawing room' - perfect for our art group as we all got to know each other socialising together! The paintings produced by everyone were 'ab, fab' and a real inspiration to me in all honestly...and the real reason I'm a tutor. Thanks for the comments guys - I'm looking forward to coming back again to Cober Hill for our next course in September and again in November '15. New and exciting times await all who are coming to join me next at Cober Hill! Brilliant news! Just heard that this colourful pastel painting has been accepted for the Open art Competition at 'Patchings' Art exhibition 2015! The exhibition will be on show at 'Patchings Art, Craft and Photography Festival' Patchings Art centre, Oxton Road, Calverton, Nottinghamshire NG14 6NU from 4 June - 19 July '15. Patchings is one of the major creative arts festivals within the creative calendar and the competition gets tougher every year so...I'm pretty pleased that the postman dropped me the good news today. 2015 is the 22nd Patchings Art, Craft and Photography Festival. 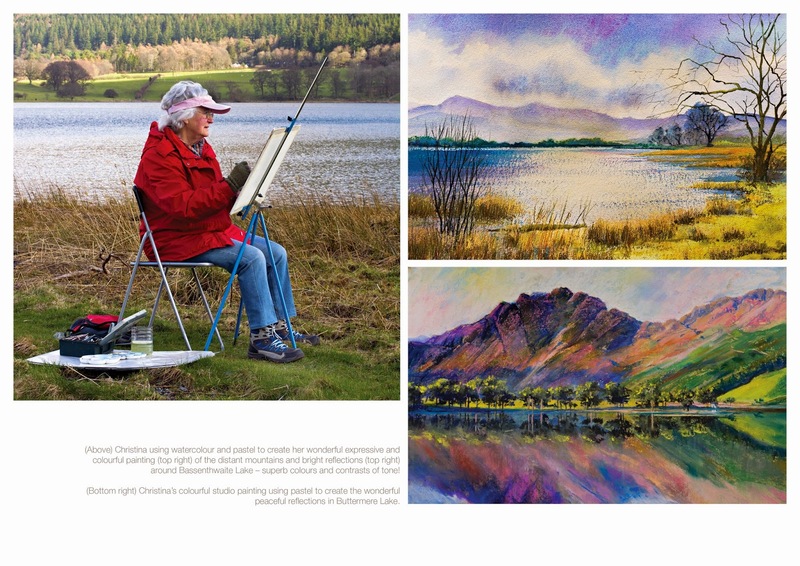 This popular annual event attracts over 15,000 visitors and comprises over 150 renowned artists and crafts people demonstrating, exhibiting and selling their work...and I'll be doing all three! 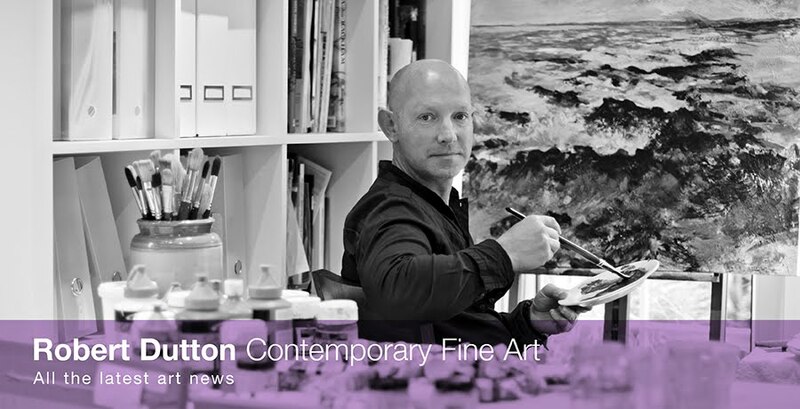 Besides showing the above painting in the open exhibition I'll be teaching and sharing my award winning art techniques with you in two seascape workshops on Saturday 6 June sponsored by 'The Artist' and 'Canson' papers. 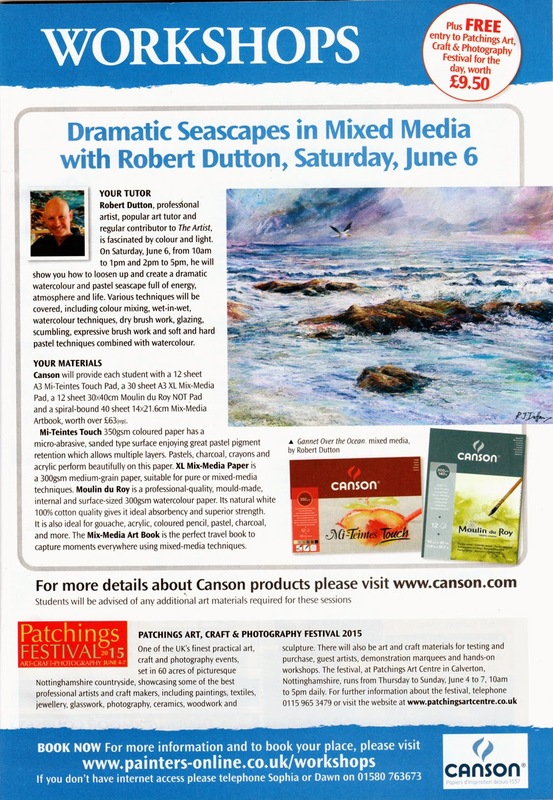 The cost of each three-hour session is £50 (inc VAT) per person and includes one to one and group art instruction, Canson paper worth over £60(rrp), PLUS free entry to Patchings Art, Craft and Photography Festival for the day, worth £9.50. Your generous selection of Canson fine art papers will include a 12 sheet A3 Mi-Teintes Touch Pad, a 30 sheet A3 XL Mix-MediaPad, a 12 sheet 30x40cm Moulin du Roy NOT Pad and a spiral-bound 40 sheet 14x21.6cm Mix-Media Artbook, worth over £63(rrp). Enlarge the attached advert to find out further details. The morning workshop is now full but there are some places remaining on the afternoon workshops but...get your skates on as the afternoon session is NOW FILLING VERY QUICKLY as well! The following day I'll be working closely with Canson (since I'm on of their UK Ambassadors now) demonstrating for them in the main marque which holds over 200 people for the following day on Sunday 7 June with pastels and mixed media on their beautiful papers for everyone to see just how responsive they really are for expressive art techniques! 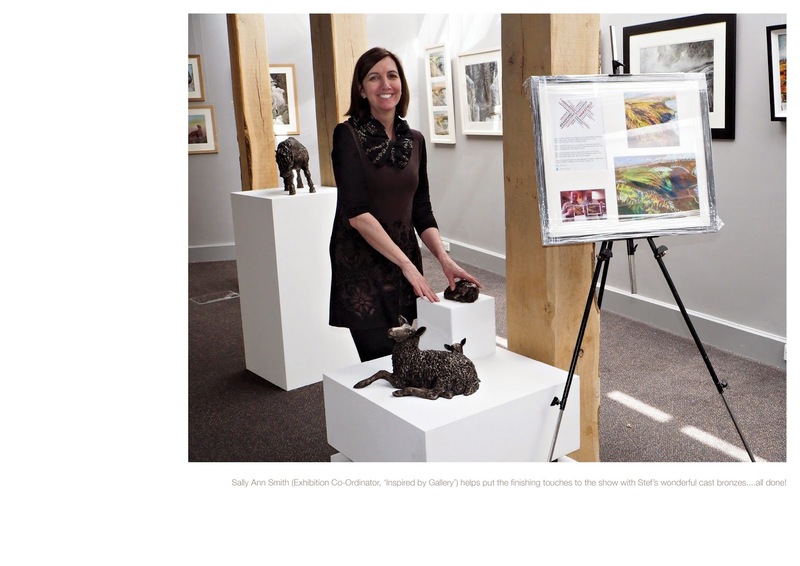 We're in the final week of our exhibition at 'inspired by...Gallery', Danby in The north York Moors. 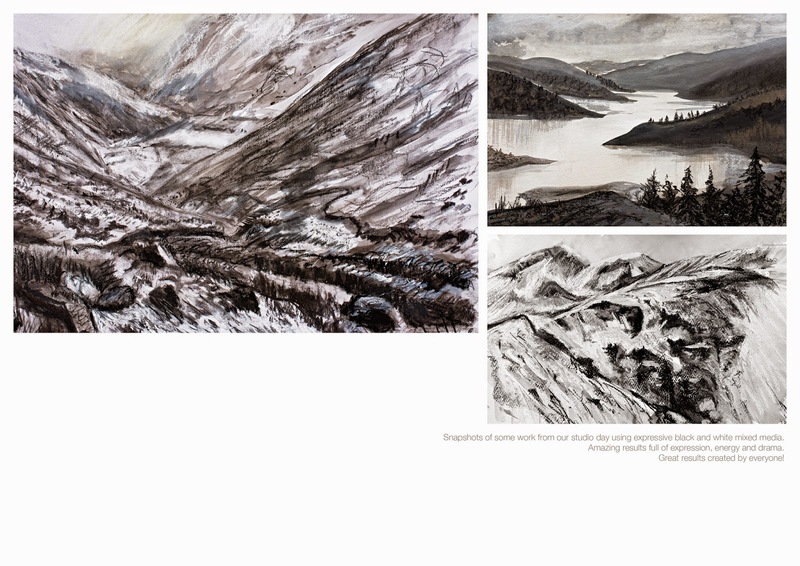 Here's a few examples of our exciting show before you get there when heading our way. Finishes on 4 May and after that the collections split up and placed in different galleries far and wide so...the choice is yours...for a limited time remaining only! 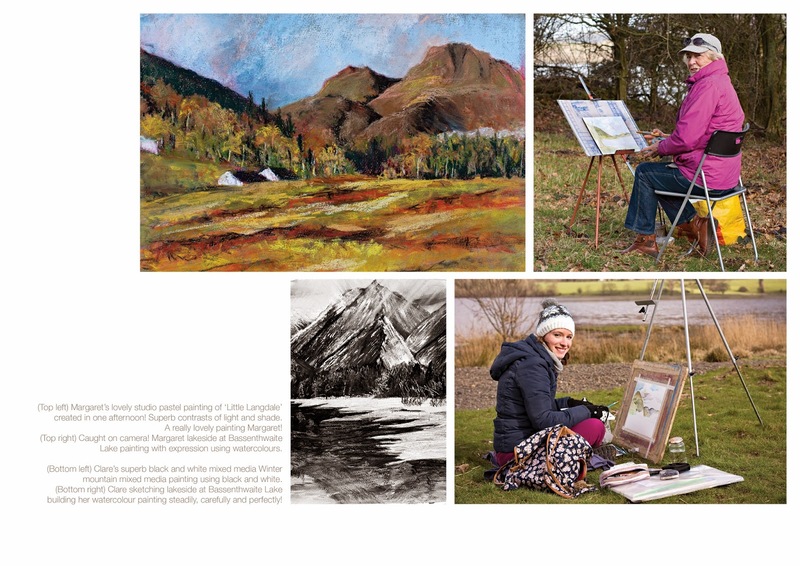 It was an absolute pleasure to teach many different students keen and willing to learn contemporary watercolour and pastel outdoor and indoor painting techniques at Higham Hall recently. The exciting and enjoyable experiences for everyone of different levels of ability was absolutely great! 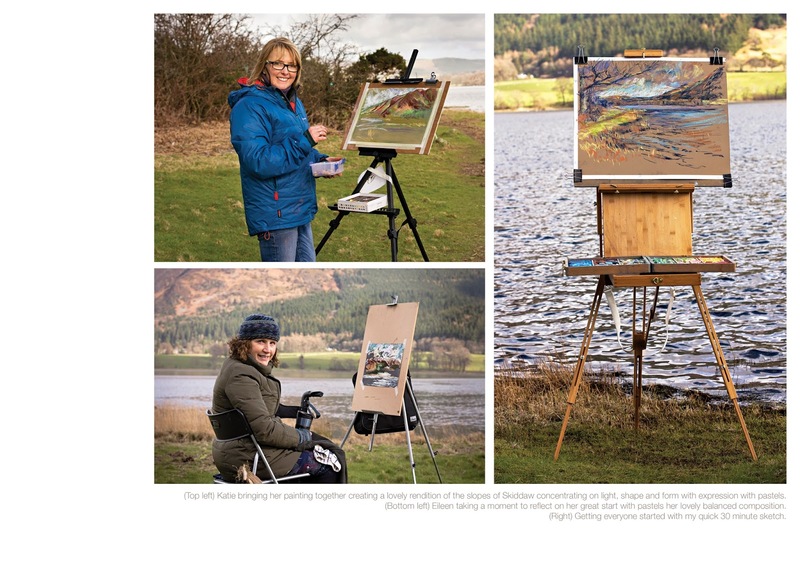 As a tutor it was really encouraging to see just how much everyone achieved in our fun packed week working lakeside around Bassenthwaite Lake and in the fully equipped studio at Higham Hall - a fabulous venue in the heart of the Western Fells close to the historic town of Keswick. The early March weather shone for us and with everyone wrapped up well and with snacks and drinks provided from Higham Hall (everything always catered for and carefully considered by the excellent and friendly staff) we sure had 'fun in the sun' for our morning outings painting the wonderful Lakeland fells in this 'quieter' and unspoilt, natural part of The lake District! Here are a few more photos from wonderful week together with a really high standard of work created by all. The smiles say it all! I'm looking forward to returning to Higham Hall again very soon, 2 - 6 July in fact to teach another great mixed media art holiday for many new students to enjoy just as great an experience. 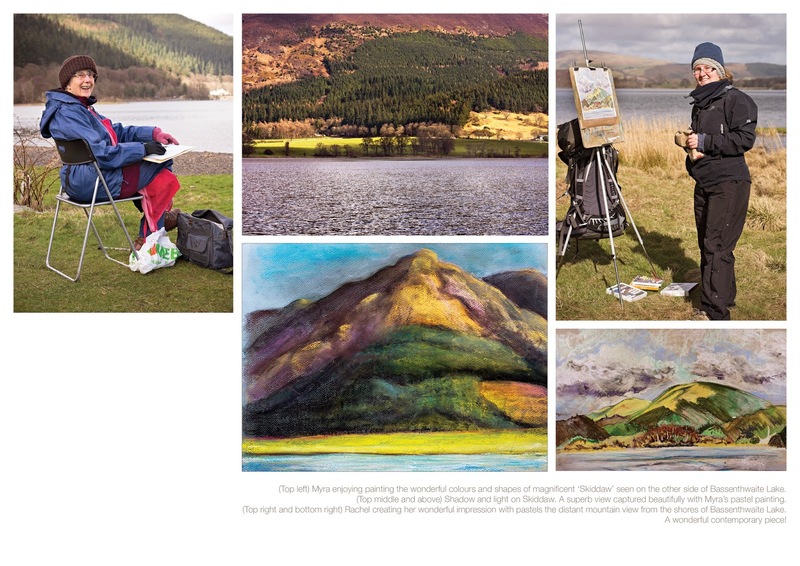 This time we will be painting the wonderful scenery in Newlands Valley and the fantastic reflections in Buttermere all very close to Higham Hall and transported in style by minibus to our superb painting locations! A little later in the year I'm back again from 1 - 6 in November to teach a dedicated art holiday using acrylics with other media on different surfaces. I'll be showing how to create, with expression, new and exciting art techniques with this versatile media how to bring the outside in with finished studio paintings from outdoor field trips! I'm really looking forward to that! a great start to our exhibition! 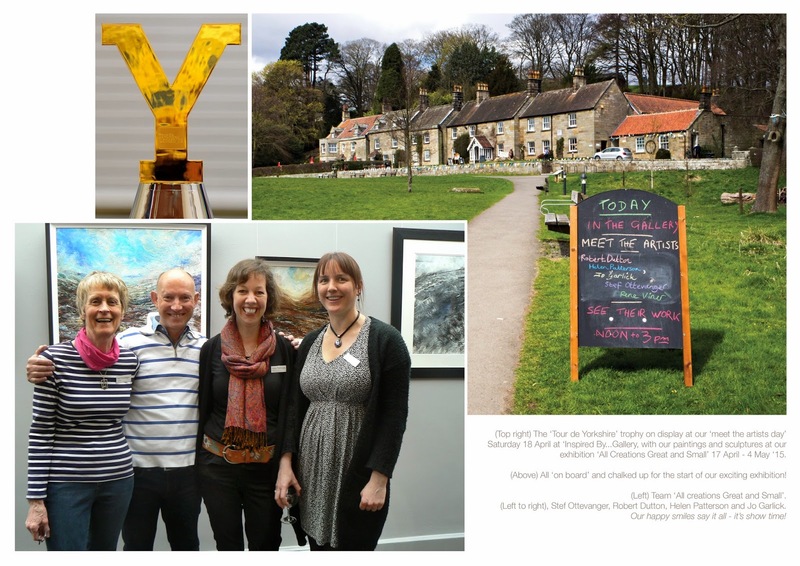 It was absolutely fabulous to meet everyone on 'meet the artists' day on Saturday 17 April for the start of our 'All creations Great and Small' exhibition at 'Inspired By... Gallery' North York Moors Visitors Centre, Danby. We were all certainly inspired by the number of people who came and it was wonderful to share some time with all those we got a chance to speak to whilst they enjoyed the exhibition. 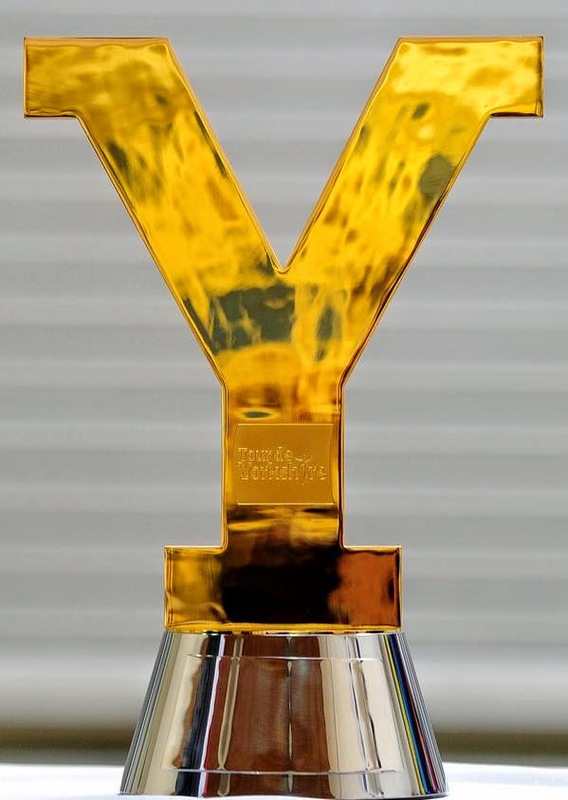 As an 'added extra' it was fantastic and a real honour and privilege for us to have the actual 'Tour de Yorkshire' cyclists trophy on display with our paintings and sculptures - it certainly looked spectacular in the glass cabinet for everyone to see. 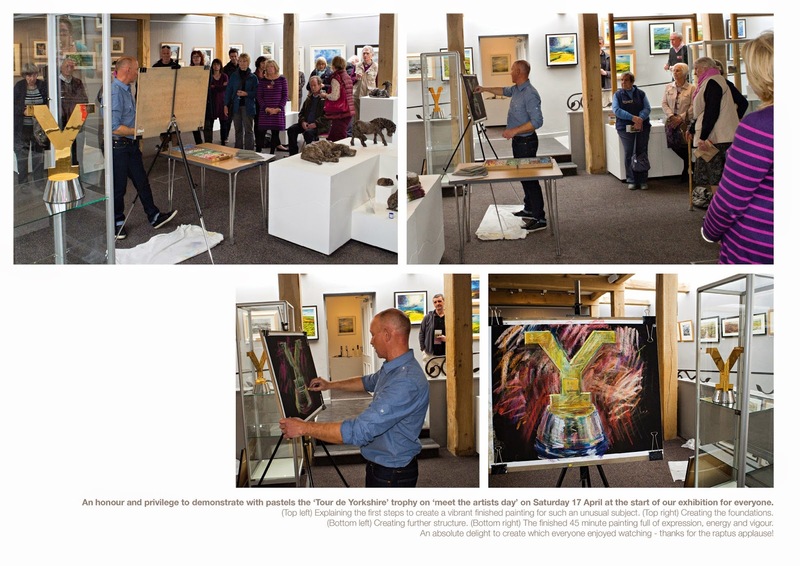 It was a great to give a pastel demonstration on our 'meet the artists' day and to showcase how to create an artists impression of the 'Tour de Yorkshire' trophy to the delight of everyone to include keen cyclists who heard about the trophy being there too. 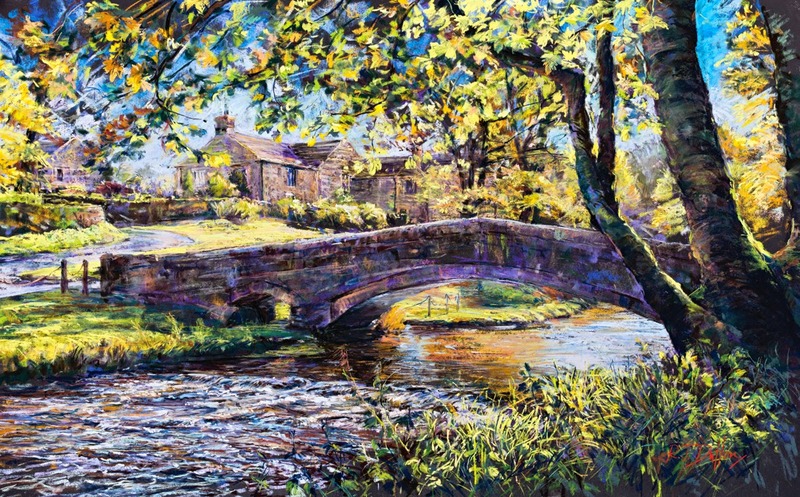 Despite the Tour de Yorkshire trophy now on its own special tour around Yorkshire, the display of our exciting and colourful exhibition of paintings and sculptures inspired by the North York Moors and the East Coast of Yorkshire continues until Bank Holiday Monday 4 May so you'll have lots of opportunities to come and see and enjoy the show until then! That's it! 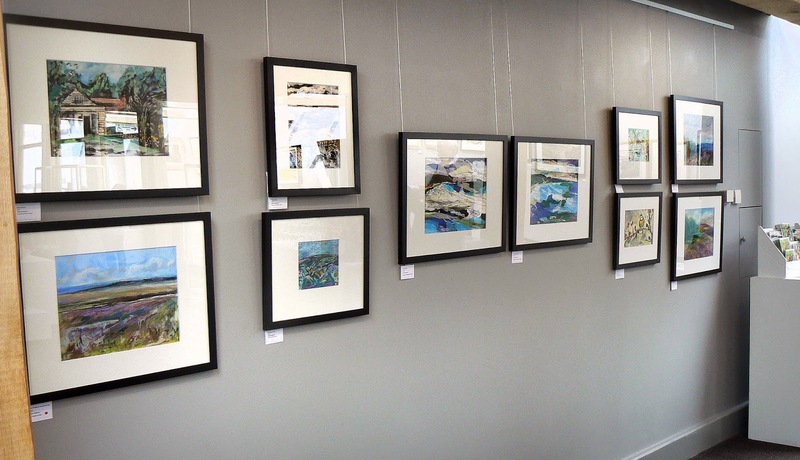 All done and dusted (quite literally) and the show is up and running for our 'All Creations Great and Small' exhibition Friday 17 April - 4 May at 'Inspired By...Gallery' The Moors National Park Centre, Danby. A big thank you from all of us to Sally Ann Smith (Exhibition Co-ordinator) and professional volunteers and The Moors National Park Centre staff for their superb support and expertise helping us create such an exciting and colourful exhibition for you. Don't forget, it's meet the artists day tomorrow with an exclusive opportunity to see the 'Tour de Yorkshire Trophy' right there in the exhibition! 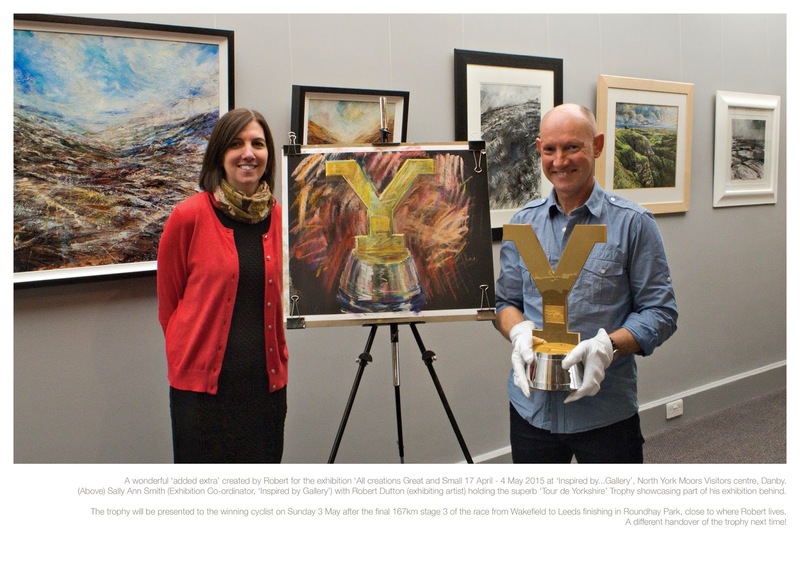 A fantastic opportunity for me as well to demonstrate expressive pastel techniques in the afternoon for you using the actual 'Tour de Yorkshire Trophy' as my subject! We look forward to meeting you...see you all there! 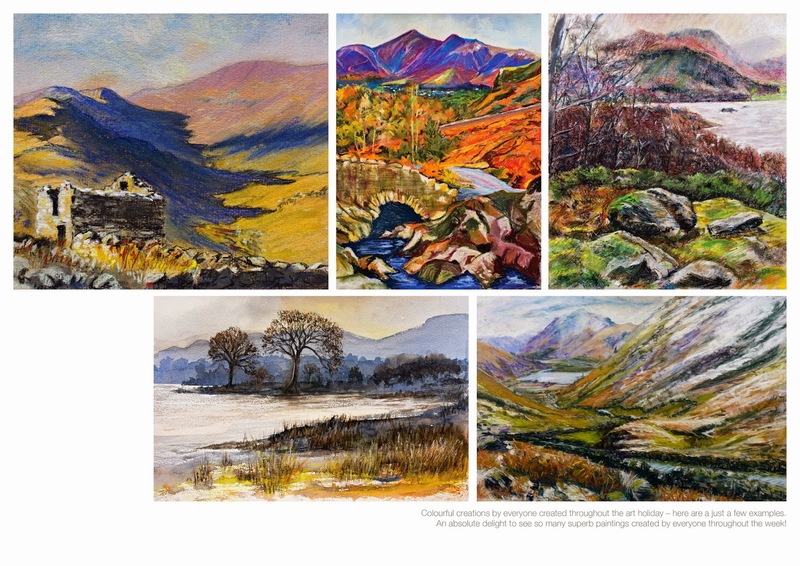 Collect these from the framers recently and now ready for the show. Great news that everything now has been catalogued, listed, priced, photographed. Just the delivery to the gallery now left to do (on my way up to see a buyer with another) and the wall hanging to do. Show starts Friday 17 April at 10am. Party time on Saturday 18 April with 'Meet the artists day' with drinks and nibbles 12 noon until 3pm. Time for me and my studio assistant to put our feet up...for a bit anyway! One of us is taking real advantage of the all the paintings being done for sure! 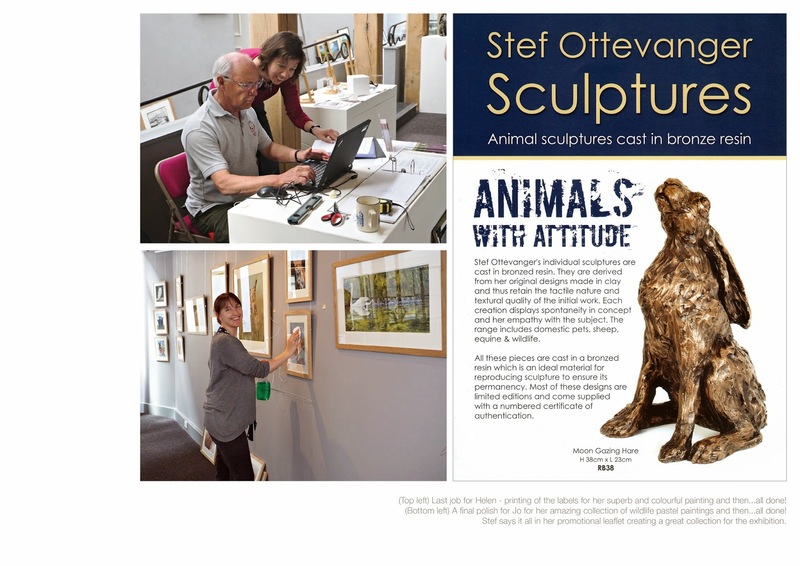 I'm delighted that all my paintings for the exhibition to be shown with Helen Patterson's wonderful wildlife paintings, Jo Garlick's exacting wildlife and landscapes, Stef Ottevanger's superb sculptures are finally all done! All looking great together for your 'All Creations Great and Small' exhibition at 'Inspired By...Gallery' 17 April - 4 May '15 starting in 5 days time! Exciting times ahead! 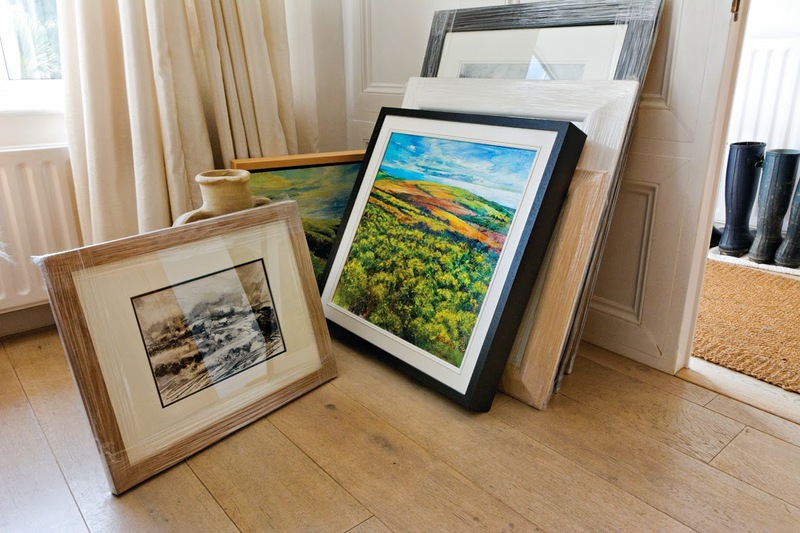 Wine and nibbles are bought, labels done, invites sent, paintings packed...and lots, lots more from all of us done to create this very special exhibition celebrating the wonderful North York Moors landscape and wildlife for all of you! Free 'Meet the Artists' day on Saturday 18 April 12 noon to 3pm. See you soon, and enjoy the show!